It all started when I had a successful weekend playing poker at the Downstream Casino near Joplin, MO.. Feeling good about my win, I arrived back in Springfield, MO., woke my daughter up, and threw some money on the bed. I always share my winnings at poker or the dice tables with my family. It motivates me to play better and I feel good about it. Rossana picked up the money and stuffed it beneath her pillow. Diamond hunting? Where in the world would that be, I asked. She did a quick Google search on our computer and pulled up the Crater of Diamonds in Murpheesboro, ARK. It was a four-hour drive from Springfield. She left the next day with my blessings. 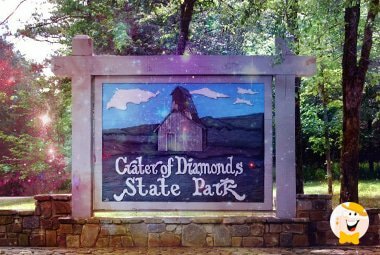 The Crater of Diamonds is a state park in Arkansas where visitors can buy a permit to search for diamonds. They are authorized to keep whatever they find. The place has camping facilities and attracts thousands of visitors each year. Some of them have found diamonds worth up to $50,000. Most of the big discoveries have occurred after a heavy rainstorm. The rain washes the soil and makes the glistening diamonds easy to spot. Rossana was gone two days. On the third day she pulled into the driveway, with a smile bigger than a harvest moon. 'I found a diamond,' she said excitedly. The gemstone she found was an industrial diamond. It wasn't worth much but Rossana loved it. A couple of days after she returned home, another visitor found a five-carat diamond near the very spot where she had discovered her tiny industrial diamond. There had been a rainstorm and the stone was worth an estimated $40,000. My daughter, the adventurer. A chip off the old block and one of the most incredible people you could ever meet. I could have told her she was the diamond as big as the Ritz, but I didn't. Until now.